Looking for the perfect Montana gift for a family with a new baby? 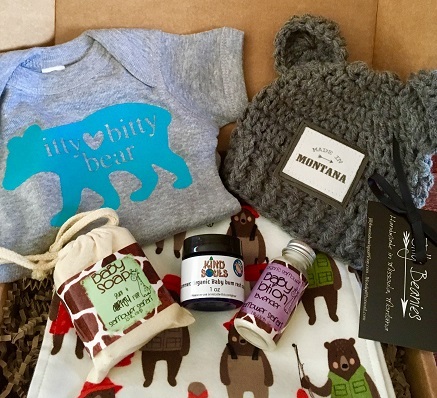 The Montana Baby Box is just what you need. It includes: A Handmade Montana Beanie from Lilly Beanies (Missoula), "itty bitty bear" onesie from Perfectly Imperfect (Polson), , Lavender Baby Lotion and Baby Soap from DAYSPA Basics (Missoula), Custom Handmade Burp Cloth from Sew Cute MT (Billings), and Bummer: Organic Baby Bum Rash Rub from Kind Souls (Missoula). **This box is separate from the monthly subscription, and can be shipped anytime. We use USPS 1-3 priority mail, and generally ship your box 1-3 days after you place your order. Contact us if you have any special instructions!